Description: Westbound CSX Juice Train at Bound Brook. Description: Q424 sits at the east end of West Springfield Yard. Description: Q425 struggles uphill toward the "false summit" at the west end of the cut with CSX 4806 and 4811 on the point. Description: The N009-09 snakes through a reverse curve just around the bend from Camp Two in the Clinchfield Loops. The train is returning to Wells, WV, for more black diamonds. Description: An eastbound passing my old office at Cabin Creek Junction. 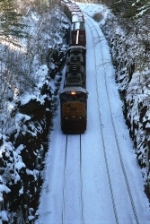 Description: An eastbound emerging from Big Bend Tunnel at Talcott, West Virginia. 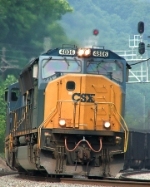 Description: This photo of an eastbound CSX train at Cabin Creek Junction was taken by my 8 year old son. Description: Q121 streaks south through Pembroke. Description: Two 70MAC's lead CSX U368 northbound on a dark cloudy day in Kingsport. Description: Detail shot of the lead engine. Description: dark roster shot of 4806. Description: It came out pixelated when I made it smaller. http://www.flickr.com/photos/jman_photos/3103754330/ is better.